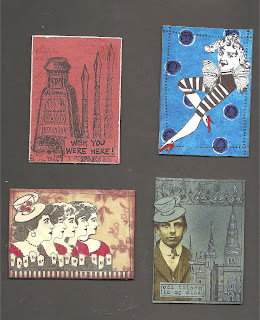 These ATCs were all made for me by the lovely Chriss Rollins who organises the Artists Trading Club atc swap each month. She is amazingly talented and creative and I'm delighted to have some of her fab work to keep. Ooooh, these are lovely - lucky ol' you! Hi,thanks for your sweet comment on my blog ...your work is lovely to and i saw your great swap...lucky girl. These are AWESOME, each and every one is so unique! Well done, Penny!